Newsroom Home / SEBS Departments / Environmental Sciences / The Scream: What Were Those Colorful, Wavy Clouds in Edvard Munch’s Famous Painting? Share the post "The Scream: What Were Those Colorful, Wavy Clouds in Edvard Munch’s Famous Painting?" 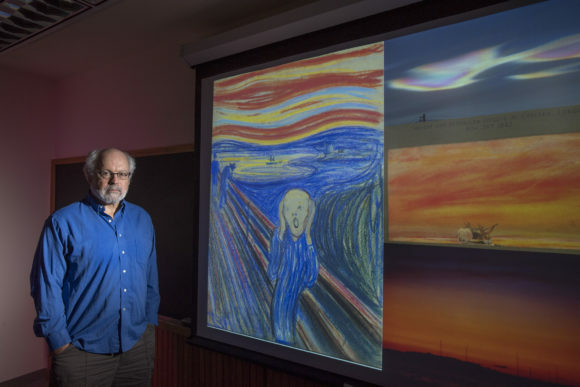 Rutgers Professor Alan Robock with an image of The Scream, an 1895 painting by Norwegian artist Edvard Munch. From top to bottom on the right are: a nacreous cloud over McMurdo Station in Antarctica in 2004; an 1883 drawing by William Ascroft showing the sky in London after the Krakatau eruption; and a 1982 volcanic sunset over Lake Mendota in Madison, Wisconsin, after the El Chichón eruption in Mexico. Photo: Nick Romanenko/Rutgers University. But scientists at Rutgers University–New Brunswick, University of Oxford and University of London suggest that nacreous, or “mother of pearl,” clouds which can be seen in southern Norway inspired the dramatic scene in the painting. Their study is published in the Bulletin of the American Meteorological Society. Iridescent light from below the horizon illuminates polar stratospheric clouds, also known as nacreous clouds. Robock said the sky colors and patterns in Munch’s paintings match sunset colors better when nacreous clouds are present versus other scenarios. The study builds on a 2017 study that also proposed nacreous clouds. The new study provides a more detailed and scientific analysis of Munch’s paintings, focusing on photographs of volcanic sunsets and nacreous clouds and analyzing the color content and cloud patterns. If the new analysis is correct, Munch’s art is one of the earliest visual documentations of nacreous clouds, the study says. Robock and others have previously proposed that a volcanic sunset inspired the painting, and he still thinks that’s possible.